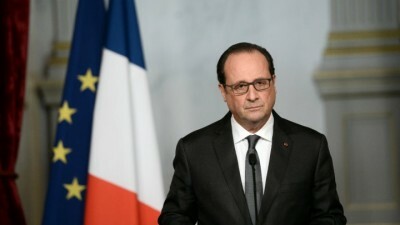 Hollande to extend the state of emergency by another three months. French Prime Minister Francois Hollande said Friday morning local time that he would “strengthen our actions” in Syria and Iraq and extend the state of emergency by another three months, hours after a truck plowed into a crowd of Bastille Day revelers in Nice, killing at least 84 people and injuring scores more. The assault was the third such terrorist attack in Western Europe in eight months. Police identified the driver of the van as Mohamed Lahouaiej Bouhlel, a 31-year-old Tunisian living in France. Witnesses said that Bouhlel opened fire before officers returned fire and fatally shot him. He was known to the police in connection with a series of petty street crimes but was not on the watch list of French intelligence services, Reuters reporterd Friday. “We will strengthen our actions in Syria and Iraq, we will continue to strike those that attack us from their cells,” said Hollande in a national address. He said he will present the plan to extend the state of emergency to parliament next week. He had said earlier that he would end the months-long state of emergency on July 26. “The casualties of this tragedy are huge — 80 people are dead, 18 in critical condition, many people are injured. Our thoughts go, once again, with the families of the victims, with those who are now deeply affected and feel an immense sorrow. But also with all the residents of Nice, who tonight were deeply traumatized and plunged into a state of worry,” said Cazeneuve. The driver, who drove at high speed for over one mile along the famed Promenade des Anglais seafront before hitting the mass of spectators, was shot dead, Sub-Prefect Sebastien Humbert told France Infos radio. Cazeneuve said he had not been definitively identified. “The identification of the criminal is currently being worked on, as well as investigating whether or not he had accomplice” said the interior minister. Neither he nor other political leaders who spoke publicly in the hours after the attack confirmed media reports that the assailant was a Nice resident of Tunisian origin. Thursday marked a day of festivities for Bastille Day, a national holiday in France. No cause for the attack is yet clear, but the mayor of Nice has confirmed that the truck carried weapons and grenades. French media are also reporting that the driver fired shots while running into the crowd, which has not been officially confirmed. Hollande said that “the terrorist character of the attack cannot be denied.” The anti-terrorism prosecutor is still investigating the attack. “We want to say to the French people, and with a lot of force: we will not give in. France will not give in to the terrorist threat. We have moved into a new era, and France will have to live with terrorism,” said Valls. The French consulate in Turkey had cancelled its Bastille Day celebrations earlier due to security threats, reported Liberation. Almost eight months ago, Islamic State group militants killed 130 people in Paris. On Sunday, France had breathed a sigh of relief as the month-long Euro 2016 soccer tournament ended without a feared attack.